8/365(+1), a photo by Luca Rossini on Flickr. It’s Goodbye Day. He’s Michele, he’s a neurologist, a neuroscientist, and an amazing musician (check out his band’s music at Chat Noir). He’s my best friend, the one I missed most when I lived in the Netherlands, and he’s the one who’s leaving Rome, now, and for a much further destination: Boston, USA. He’s going to be there just for one year, but the truth is that when an Italian doctor leaves Italy it is very difficult he’ll come back home. I did, come back, so I still have hope. Otherwise, I may will be leaving again, who knows. Anyway, I am really happy for him, I know that he really went to hating our country and most of its idiosyncrasies, and I think that right now he really needs (and deserves) to experience another way of living. He’s going to the best place in the world to do his job, so he’ll have a lot of fun. 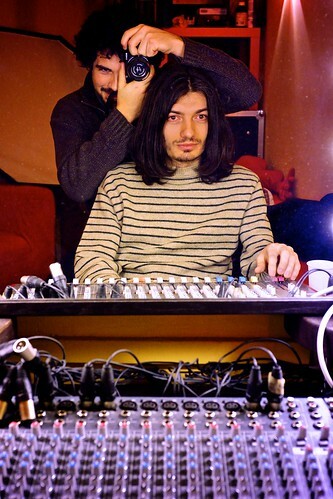 About the shot, this was taken at his farewell party, in what has been Chat Noir’s music studio, where most of their beautiful music was born.